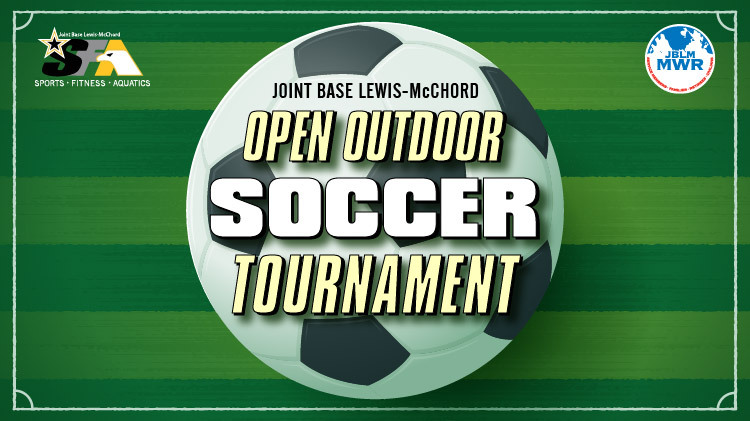 Date: Feb 16 2019, 12 p.m. - 1 p.m.
Join the new 2019 Open Outdoor Soccer Tournament! This is now a one-day event, which includes 1 rotation through a round robin, and then a single elimination tournament seeded based on the results of the round robin. This event only has enough slots for up to 12 teams, and it will be first come first serve. Eligibility is active duty military personnel, Army / Air Force Reserve and National Guard service members assigned to JBLM, dependents at least 18 years old, and all DOD/DA/DAF Civilians. The coaches/info meeting will take place at the Lewis North Athletic Complex on Lewis North at 1200 on February 16th. The deadline to sign up and pay the $130 fee is COB 22 February to Cowan Stadium on Lewis Main. The tournament will be played on 2 March 2019 at the Lewis North Athletic Complex Soccer Fields.